P.S. The photos above were the only ones I found - taken before we moved into this house! - so the quality and detail are not great, but should give you an idea of what it was like before. I wanted the doors to look as uniform as possible and also I wanted to change the door furniture (and light fixtures and anything of the colour gold) to silver instead - generally, I'm not a fan of gold either. So, I took a week of work and planned to get these done. I removed the old handles, locks and hinges, filled holes, sanded, painted (3 to 4 coats each) and fitted new handles, locks and hinges to all 4 doors. 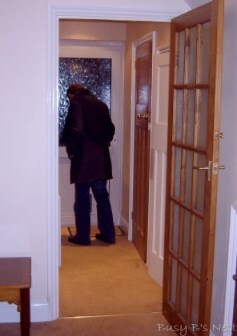 I even "freshened" up the door frames and radiators - everything seemed slightly yellow against the now very white doors! It was a long process, but definitely worth it! Oh, just one job I had to do afterwards that I didn't enjoy very much: cleaning the paint of the glass panes on two of the doors! I thought I'd save time, by not putting masking tape on the glass panes and that it would be easy to remove the excess paint once dry. But, it was not! Even with the help of my steam cleaner - which I found was the best method to remove the paint - it took me A.Very.Long.Time! 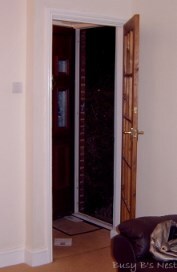 ... and these ones are the doors to the downstairs cloakroom, utility room and other living room door (from left to right). If you are wondering about the "mouse" hole on the utility room door, no, there isn't a giant mouse in our house. We used to keep our cat littler tray in there before it became officially the utility room and although she no longer needs a litter tray, she still likes to hide in there (mainly from the kids!) occasionally, so we left it there for her.